The Bay of Whales off the Ross Ice Shelf, Antarc­tica. The upper photo is a South-facing view of the Bay and the Ice Shelf from the Ross Sea. The lower photo is a satellite image, in which the South Pole is approximately in the direction of our one o'clock. 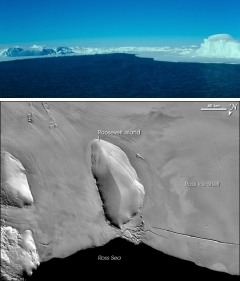 As is evident in the lower photo, the Ross Ice Shelf, which is essentially a very complicated glacier floating on the Ross Sea, rides over and around a large island, known as Roosevelt Island. The highest point of the central ridge of Roosevelt Island is about 1800 feet above sea level. It is this island that creates the "bay" by slowing, relative to the rest of the ice sheet, the part of the ice sheet that must travel over the island. The Bay of Whales was first discovered by Sir James Clark Ross in 1841. Of course, he knew nothing of Roosevelt Island. Next to visit was Capt. Robert F. Scott in 1902, leading the Discovery Expedition. For their visit, the Bay was more of a nook in shape, due to the randomness of glacial calving at the edge of the Shelf. Next to visit was the Nimrod Expedition in 1908, led by Ernest Shackleton, who gave the Bay its name. The Bay was now no longer a nook — it was a bay again. This variation created some ambiguity about the identity of the feature, and added to anxiety about its stability and suitability as a base camp. As Capt. Roald Amundsen was planning his own assault on the South Pole, he had read all these reports, and shrewdly guessed that land of some kind lay beneath the ice shelf at this point, grounding it, and that the feature would be stable enough for a base camp. It had numerous other advantages, including an abundance of wildlife for fresh meat, and its position — almost 80 miles further south than any other possible base on edge of the shelf. It was a good guess — a very good guess. Upper photo courtesy P. Bond. Lower photo courtesy the U.S. National Snow and Ice Data Center. Knowing how to make good guesses — really good guesses — is a skill so valuable that a mystique has grown up about it. Most of us believe that guessing right is so difficult that doing it consistently requires inborn talent, and there's no point trying to learn how to do it better. Many look upon shrewd guesses as examples of genius that we can't possibly emulate. Although consistently shrewd guessing probably does require genius, we can learn how to make better guesses at least once in a while — for instance, when we're knowledgeable or when we have exceptional intuition about the specific domain of the guess. Here are some strategies for getting better at guessing right. The defining property of guesses is that we can't be sure they're right. That's why an aversion to saying anything that might be wrong makes guessing difficult. This presents challenges for people in occupations in which credibility is highly valued. But even there, we can limit the impact of guessing on credibility by clearly identifying guesses as such. Believing that mistakes are disastrous constrains the imagination. Be willing to let your mind float. A guess is not a fact. It might be a good guess, but it's still a guess, no matter how well it explains what you've observed, and no matter how much you prefer the world described by the implications of that guess. Distinguishing between factual reality and guesses can be difficult, because the mixture of guesses and facts is a more complex picture of the world than is a collection of facts. It's helpful to make more than one guess, because a multiplicity of guesses — three or more — is a reminder that guesses are not facts. When describing a guess to yourself or others, it also helps to begin with the phrase, "I don't know (or we can't know) for sure, but…"
When we make A guess is not a fact. but it's still a guess.observations, we tend to use familiar vantage points. Stepping away from the familiar usually requires conscious intent, because the unfamiliar is unfamiliar. For instance, searching for commonalities between disparate items is difficult for pairs of items that don't usually go together. A rewarding question to ask about each pair might be, "If these two things had a common cause, what would that be?" The problem is even more complicated — and it can be even more rewarding — when we think of three items at once, or four. Would you like to see your comments posted here? rbrenObdlfxwNZrDYDMcLner@ChacszuFFKRzBKtNhUZOoCanyon.comSend me your comments by email, or by Web form. I offer email and telephone coaching at both corporate and individual rates. Contact Rick for details at rbrenZZhTbZELOjUlTVQyner@ChacSZkmxLxvpJuPSAMjoCanyon.com or (650) 787-6475, or toll-free in the continental US at (866) 378-5470.